Windesheim University of Applied Sciences is located in Zwole, Netherlands. Zwolle is a medium-sized city only one hour from Amsterdam. About 30,000 students study in Zwolle in one of the four Universities of Applied Sciences. As well as a beautiful historic centre, the city has lots of parks (really nice for picnics! ), plus atmospheric cafés and places to eat. Type of SCHOOL: Dutch University of Applied Sciences which provides Higher Education and research (for Undergraduates). 50 Bachelor programmes of which 2 in English and numerous Exchange programmes. Size of Campus: 37 square miles ( in Dutch 200 by 300 meters). Large Campus with 9 Educational Buildings each with their own theme (T is for Technical, B is for Business). In addition numerous sports facilities with 3 swimming pools, fitness area, climbing wall, and judo rooms. Over 35 different nationalities mostly from Europe. All COMPLETED applications need to be handed in before May 15th. Do you want to change the world and looking for an international challenge? Are sustainability, human rights, global health, social responsibility, global warming, civil society, and advocacy for minorities themes that you care about? Do you want to contribute personally and professionally to a better world? 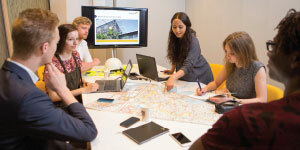 In the bachelor’s Business Administration program taught at Windesheim Honours College, called Global Project and Change Management, we teach you how you can make a difference. Windesheim is in the top three of broad-based Universities of Applied Sciences in the Netherlands; we are highly ranked by both students and experts. Students appreciate our personal approach that allows them to work in small teams. Our lecturers are coaches as well, challenging students to reflect and think critically and get the best out of themselves. 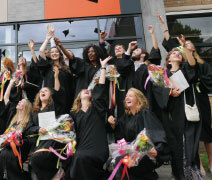 Windesheim Honours College is a faculty within Windesheim. Our BBA program is taught in a unique educational setting. Traditionally, research universities focus on thinkers and applied science universities focus on doers. We focus on both: we want you to become a critical thinker at an academic level, but we also expect you to apply the knowledge you have gained. In our program, we combine theory, practice, project management, business, and research with global issues. The program consists of courses, real projects, an international internship, and personal and professional career counseling. In the end, you’ll know how to lead a project team and how to put innovative ideas to practice. You’ll become a changemaker, able to create sustainable value for society. In Year 1 and 2, we lay the basis for your future profession as Project Manager in different theoretical courses. In addition, you will start right away working on an actual project with real clients throughout both years. We’ll take your project management skills to a professional level with courses like Advanced Project Management and Project Teams & Leadership. You’ll start Year 3 with the honors minor: Managing Projects in a Globalized World. Two days per week are spent working on a project at an organization (the client). The other three days are reserved for intensive training, workshops, and master classes from experts from the work field. The second half of Year 3 is dedicated to the 17 Sustainable Development Goals of the United Nations, like gender equality, no poverty, climate action, and peace and justice. In this semester, you’ll have the opportunity to “Create Value” on one of these goals. In what way? That’s up to you. We believe in the responsibility and accountability of our students and will give them support to develop themselves and deepen their knowledge on topics they choose themselves. You’ll start Year 4 with either another semester as a “Value Creator” or follow electives (a semester at a partner university). After that, you will do your internship. This internship must entail research and a research report, and the results of that research must contribute to the development of a work field. You’ll be studying at an honors college, so we’ll have high expectations of you. Judging by the feedback from the work field, our students are doing an excellent job. • 80% of students continue pursuing a master’s degree (some even a PhD). 1. Register via studielink.nl before May 15. You will receive an automatic email asking you to complete the Student/Online Matching Test. It requires you to answer general questions about your personal situation and write an essay, among other requirements. Our BBA program selects only 80 students per year, and we work on a first-come first-served basis.